If you ride a bicycle in California, you’ve likely met Lorri Lee Lown. She leapt onto the cycling scene in 2002, when she founded Velo Girls, one of the first all-women’s cycling organizations in the United States. With a focus on developing new riders and new racers, Lorri created a series of skills clinics focused on teaching everything from the fundamentals to racing skills and tactics. She also developed the award-winning Tri-Flow Development Racing Program. Lorri is a seasoned speaker, with a quick wit and an easy manner that makes participants feel comfortable and engaged. She’s been a frequent guest speaker at bike shops and corporations throughout Northern California and was a featured speaker at the first-ever USA Cycling Women’s Coaching Summit at the Olympic Training Center in Colorado Springs, CO. She was chair of the Yoplait Women’s Grassroots Cycling Initiative and spoke at InterBike (the annual bicycle industry trade show). 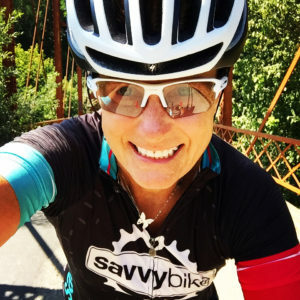 An admitted reluctant athlete, Lorri began riding in 1999, and over the years has participated in charity cycling events such as the CA AIDS Ride and MS Waves to Wine. She’s raced cyclocross, road, track, and mountain and piloted a blind tandem to 3 bronze medal finishes in the 2013 US Paracycling Track National Championship at Carson Velodrome in Los Angeles. She’s toured throughout the United States, Spain, New Zealand, and Australia. She even worked as a bicycle tour guide for Undiscovered Country Tours. In addition to her work with Velo Girls and Savvy Bike, Lorri has coached for the NorCal High School Mountain Bike League, the Northern California Nevada Cycling Association (NCNCA) Early Bird Training Series, and for teams and clubs throughout California. She’s been a guest coach with AthletiCamps and the Specialized Women’s Sports Camp. She founded and directed the Women’s Outreach Programs for Sea Otter Classic in Monterey, CA. As an active member of the cycling community, she’s been involved with the governance of the Silicon Valley Bicycle Coalition and the NCNCA. She’s also worked with Trips for Kids (developing their Girls Day in the Dirt program), Turning Wheels for Kids, and is the road cycling coach for the AIDS/Lifecycle Training Ride Leader Certification program. Lorri believes the bike should be FUN and has worked tirelessly to promote cycling in all forms through her skills clinics, community outreach, and educational programs.